It’s been kind of an intensely busy week. Wow. Has it ever. We had an auspicious natal celebration, wherein Ms. E the younger celebrated that I haven’t sold her to gypsies her 13th birthday in grand style. Not exactly grand style. Alas. Her friends flaked on our day out, the car broke down (twice), we all got sick from sushi, our movie tickets were wrong and we didn’t get cake until nearly midnight when the birthday was over, but, we did our best and she’s another year older. It is hard to believe that my baby is 13. I’ve enjoyed every step of the journey, and a friend dug up an old picture of Em at about 3, on her way to Pride in SF. I hadn’t seen it before. Her smile hasn’t changed a bit. Yesterday involved medical procedures which are distinctly unfun and which I will not go into here. Suffice it to say, one would think the doctor would be obliged to buy me dinner first. Now I adore my doctor and trust her implicitly, but if I’d known what was coming I’d have ordered the lobster. Just sayin. I was traumatized. My driver and I decided that rather than go home and cry, some therapy was in order. There was Jamaican food therapy at this little place we found around the corner from Wildfiber in Santa Monica. Because obviously what a girl needs to do after medical trauma is to go fondle cashmere and then eat spicy jerk chicken and fried plantains until she feels completely better. So that is exactly what we did. Yes, that is two ply Mongolian cashmere laceweight, thank you. 400 yards. I am making myself something delicious in a scarf. Wildfiber has an entire section of Mongolian cashmere, in addition to the infamous Wall O Koigu, and now they are carrying handspun from people like Twisted Sisters, Tanglewood, Chasing Rainbows Dyeworks… it’s EVIL, I tell you. That store is fibery evil in the very best way. 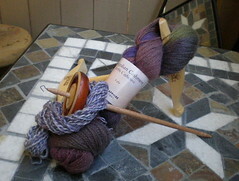 We also ran over to Stick and Stone in Van Nuys, where I found my spinning wheel!! I have settled on a Kromski Sonata and arranged to make a downpayment on it today. My mom is going to be here on Friday, next, and will pay for it then. I am SO full of the squee but will not properly express this until it is home in my living room. Also a Kromski mini niddy-noddy and this Spindlewood spindle leaped into my hands and demanded to come home. Because I needed the retail therapy. Which is what I said about the cashmere, and really, that excuse was getting thin, but I bought them anyway. I will not be going to Fiber Fest as a result. Self control. Heh. Right. Then we came home and discovered the kittens in the midst of certain activities were Very Naughty and involved some singles and a roll of paper towels, and also found this therapeutic in the extreme. There is knitting going on. Charade is coming along nicely, though it has become the “Waiting Room sock” because I seem to knit on it a lot in waiting rooms or on exam tables waiting for doctors to come in lately. It is calming, and I love it, even if I am not loving the flashing spiraling stripe that wants to plague me. I think we’ll have a heel today. Test results from yesterday’s happy fun torture in 3 weeks. 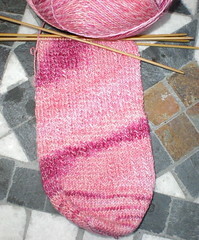 Hopefully I’ll have the pair finished by then and will not need a waiting room sock anymore. OMG. That video is too funny! Happy b’day to girlchild, and you, dear, take care of YOU! (ok you obviously did that…dinner, yarn…yummy! ROFLMAO — Holy Kittens and Roving Batman!!! That is TOO CUTE! Strikes me the last time I went to Fiber Fest they gave away a lot of free stuff. Just saying. Kitties are so cute I made my children watch, too! Ooh, let’s hear it for happy birthdays (sorry about the various snafus — hope she got some yummy cake anyway) and for a waiting-room-free existence. Oh, and for kittens, of course. Remind me to watch when I get home from work.